If ever a kid grew up steeped in Spanish food lore it was Andres Ruiz, the 57-year-old chef who has just opened La Bodega, a casual and traditional Spanish restaurant on Brunswick Street. Before Andres was born, his mother Maria cooked in the Royal Palace of Madrid. It was there she met Juan, the royal guard who was to become Andres’ father. The couple moved to the Spanish Canary Islands, off the coast of Morocco, where Andres was the sixth and last of their children. As the youngest, he was always with his mother, at the market and in the kitchen, or with his father in the yard, helping build a fire to cook paella. Still a boy, he worked in a Gran Canaria produce market, absorbing knowledge about meat, seafood and vegetables. That heritage, plus 30 years’ experience as a chef in Spain and Melbourne has been harnessed for La Bodega. This is Ruiz’s second Melbourne restaurant, followingwell-loved Arcadia in Ascot Vale. He thought Fitzroy was missing out on authentic Spanish food and this rough-hewn slice of Spain is his solution. 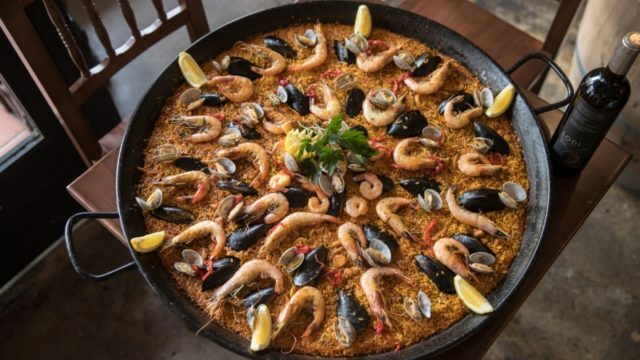 Sitting on a chunky wooden chair by a wine barrel, sipping sangria and piling into paella, it’s easy to call La Bodega a success. There are some really good dishes on offer, using excellent ingredients, and rendered with pride. The chori-papas brings together two perfect elements: spicy chorizo sausage and golden-fried potatoes tumbled with paprika. It’s a no-brainer winner. For the tajin de cordero, lamb on the bone is slow-cooked in a complex and captivating broth flavoured with dried apricots and honey. It’s one of many dishes that nods to north Africa, especially in the use of the ras el hanout – “best of the house” – spice mix that Ruiz makes here with 35 ingredients. 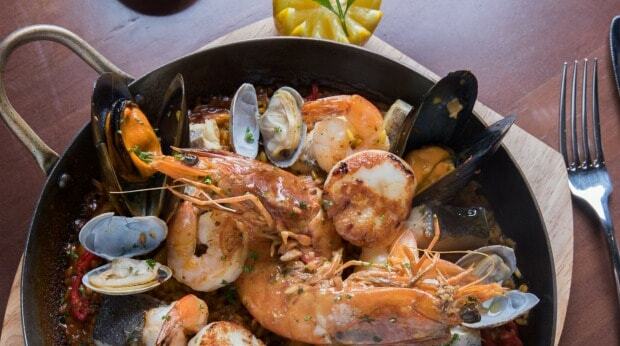 Paella is a specialty and Tuesday’s $12 paella night is a great way to get a cheap taste. Be warned that Ruiz will never put chorizo in his paella because he reckons it kills all other flavours. His versions are simple and classic, using short-grained bomba rice, swollen with house-made chicken and seafood stocks, and topped with a generous array of seafood. Just as he did as a little boy at his mother’s knee, Ruiz selects the seafood at the market. Chori Papas (chorizo and potato) from La Bodega de Andres. The sangria is based on a syrup infused with cinnamon, clove and citrus peel for three days then mixed with Spanish red wine, gin and brandy. Fresh fruit is sozzled in it all day. It’s a killer concoction that I reckon should be sipped rather than sucked through a straw because chewing on the fruit slows consumption to a safer pace. A bodega is generally a grocery store, and Andres has that covered too: jamon, chorizo, rice and olive oil are all retailed from the bar. You can even buy saffron from a jar stuffed with $7000 of the redolent red strands. There are things I’d tweak. The nine-page menu seems unnecessarily long and not all staff are adept at guiding diners through it. Paying for bread and being authentically Spanish don’t seem to go together either. But overall, La Bodega is fun and hospitable, not highly refined but the kind of place you’d send friends back to if you stumbled upon it in Valencia or Sevilla. It’s also well-priced if you come with a few people to share tapas and paella and there’s no doubt it’s part of a happy resurgence of Brunswick Street. Pro Tip: Jamon, chorizo, rice and olive oil are all retailed from the bar. 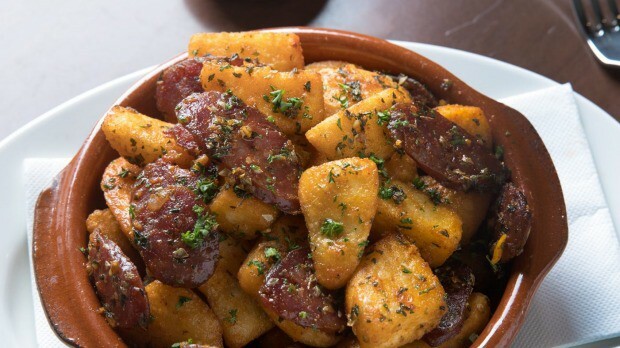 Go-to Dish: Spicy chorizo sausage and golden-fried potatoes tumbled with paprika. First published in Good Food, 28th November 2017.